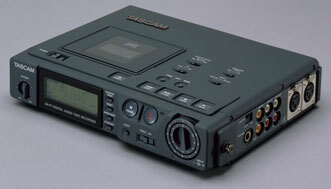 The Tascam DA-P1 portable DAT recorder automatically shuts itself off after 6 minutes when running on batteries, to save power. To turn off this feature, power up while holding down the "Stop" button. The PS-D1 AC Adapter/Battery Charger's led light indicates battery charge status: it glows red for the first two hours, then glows green during the last 30 minutes of charging. It does not turn off when the battery is finished charging. The manual indicates that one should not leave the battery in the DA-P1 when it is being "wall-powered." The Tascam BP-D1 Ni-Cd battery has a switch on the side of it. This apparently has no function. The DA-P1 manual indicates that this switch is merely there for the user to mark a battery as "charged" or "discharged". There are more good pages with a bunch of hidden DA-P1 features here and here.